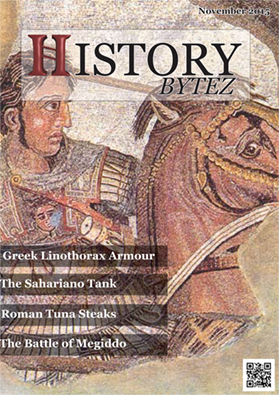 The first issue of the History Bytez Magazine has just had a final edit, and will be released very shortly. The first issue is 68 pages long and includes feature articles on the Italian Sahariano tank that never made it beyond prototype stage and the first eyewitness recorded battle, Megiddo we also test drive a Roman tuna recipe and lots more. Subscribe now and get the magazine as soon as it’s released. Either click here or follow the subscribe link at the bottom of the History Bytez homepage. Please let anyone else you know might be interested know.